GNSS View is software that reproduces satellite placement in the sky (constellations) at a given time and location based on publicly released orbital information for positioning satellites. This app displays the current location and time by default, but the set time can be modified to view changes in satellite placement. 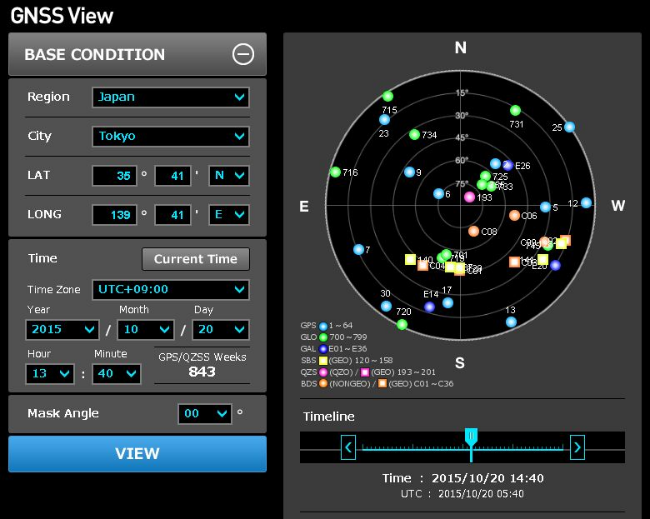 This app can display satellite placement for six satellite positioning systems, including Michibiki, GPS, GLONASS (Russia), BeiDou (China), Galileo (Europe), and the Satellite-based Augmentation System (SBAS). The four systems other than Michibiki and GPS are calculated based on publicly available orbital information from the North American Aerospace Defense Command (NORAD). In addition to the web version for regular browsers, the Android version of GNSS View is available through Google Play and the iOS version for Apple devices is available on the App Store. It is a footer menu. Copyright©2019 Cabinet Office, Government Of Japan. All Rights Reserved.